This pitch shifter is that & much more. It includes algorithms from tons of Eventide's legendary products, enhancing you shifting to space & beyond. It's also a fully capable octaver & harmonizer pedal, as well 100 built-in presets with other effects, a tuner, synthesizer, & more. There's a lot here that can be a distraction if you want a pure pitch shifter, but you'll find ways tons of ways to use the other effects. An incredible pitch shifter & fully capable harmonizer & octaver with superior algorithms & all of the extra options you could need. It's expression pedal ready for you to take control of the 11 pitch shifting options including multiple voices, detuning, & common intervals. There's nothing more I'd want out of this pedal as a pitch shifter. As a harmonizer it could use intelligent key tracking, but no big deal. A very capable mini pedal that focuses on polyphonic pitch shifting but offers more while trimming out unnecessary features to save you cash. The pitch shift mode is polyphonic, offers up to +/- 2 octaves of shifting, & is a great way to drop tune in a hurry & get back to standard after. It's very nice that it includes a detune & a harmonizer mode, but I'd like to have seen a Blend knob to control the harmony volumes. The best pitch shifter pedal unlocks the range of your guitar, giving you access to a full gamut of intervals and octaves you couldn't otherwise naturally reach. They do so intelligently, allowing you to dial in your key so you never inadvertently become ear-piercingly dissonant. Add onto or replace your original notes, the choice is yours. If any instrumentalist can get a lot of use out of the pitch shift effect, it's a guitarist. The uses are endless, from harmonizing one's own lead to filling in for a bassist. Combine it with other pedals like a looper and an entire musical universe opens up before you. And how fortunate we are, because in the old days we had to record to tape and slow the tape down or speed it up to achieve this effect and that would throw off our timing. So then, instead of time stretching, we would have to play faster or slower at normal speed and then change the timing to affect the pitch. What a nightmare. Vari-speed motors didn't help that much either. Fast-forward to the present and we have entire digital signal processors that can pitch shift with easy-to-access option knobs all tucked away in a tiny stomp box you can turn on and off with your feet. These days, the separate concepts of a pitch shifter pedal and a harmonizer pedal are quickly converging, saving us money and space on our pedalboards, too. That makes today's discussion even more pertinent as we explore which features we should expect out of a pedal, how to use it in light of the new features, and which of our top picks are the most right for your needs and preferences. Let's waste no time jumping into it. What is the Pitch Shifter Effect? In general, the pitch shift effect is a detection of an original pitch which is then either raised or lowered by a specific number of semi-tones. Although many exist in which you can define an exact amount of cents to alter the current pitch, such as software plugin versions, guitar pedal pitch shifters have a pre-defined interval where the altered pitch is optionally added back to the original pitch in order to create a harmonization. In the early days, pitch shifting was not able to be disconnected from time shifting. Playing reel-to-reel tape back faster or slower was the method used to increase or decrease pitch. Using the current digital signal processing methods, time shifting is no longer necessary to achieve the desired results. All current pedals use this digital method. What to Look for in a Pitch Shifter Pedal? There are two main features you'll want to make sure appear in the pedal you choose. They're so important that we don't even recommend any below that don't already have these features. The first is pitch-combining, which was originally only found in harmonizer pedals and octave pedals. This is referring to how the earliest pitch shifters affected the original sound and then outputted that altered signal. Newer ones can keep the original note while also outputting the new shifted notes while allowing you to mix them in at different levels. Older ones also wouldn't lock you into harmony. They were too literal, as another way of saying it. The new ones can process chords and create down-tunings as well, thanks to the second feature I want to point out. With the new polyphonic style of pedals, they can detect each string separately and help you play in different tunings all without detuning your guitar. This can save you a lot of time if you're willing to trust the machine. Other 'detune' modes will replicate your signal at a slightly lower pitch to thicken your tone. Modern pedals include what is being called 'smart pitch shifting' where you can define the key you're playing in so you never have unintended dissonant intervals. When pitch shifting, you only want to effect the lead signal, not all of the extra effects added onto it later in your signal chain. Pitch shifting is already listed as its own type of effect in the list above, making it obvious where it should be placed. If you're using them (you should be) you'll want compression and equalization to come first, as well as any noise gates. The idea is that you'll clean up and shape your waveform first before filtering it. After that, you can add all the distortion, modulation, reverb, and delay you want. But what you don't want is to have those effects pitch shifted. You want them responding to the shifted signal and not the other way around. Modern pitch shifters can do what old ones can't, which introduces a new set of knobs or LCD panels related to smart locking into the correct musical key and actually combining the lead into a harmonized line versus altering the lead only. Although knob and button options for these features are self explanatory, you'll often see panels that help you navigate through the choices. Let's talk about the knobs that are consistent across all of these pedals. Most importantly you'll find a knob labeled as Interval, Harmony, or Type, which lets you select how many semi-tones or which interval you want to shift to. If you choose by interval then that means you have a smart pitch shifter. Your options might be a third, perfect fifth, or octave, for example. Blend, Mix, or Level are all the same and let you control how loud the shifted signal is compared to the original lead, or how loud the shifted lead is, depending on if you're harmonizing or not. And of course, if the option is available you'll have a Key knob or panel to let you select which musical key to lock into so you always have pleasing, consonant sounds being played. Now that we are familiar with pitch shifter pedals in terms of what to look for and how they're used properly, it's time to peruse our overview of the current marketplace and see what the best options are for your hard-earned money. We aren't ordering these in any specific way except to note which is our top pick. You can scroll back to the top to see our other two "best in class" picks, but please give them all equal consideration. If they made this list, they're worth your time. You may like one more than we did based on our differing preferences. 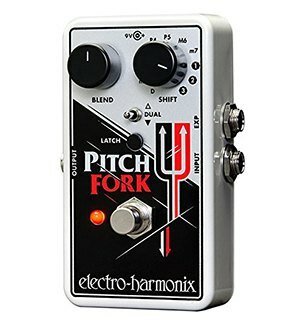 Without a doubt, the "Best Bang for the Buck" pick goes to the Electro-Harmonix Pitch Fork for focusing strictly on pitch shifting, having a reasonable price, and not skimping out on features. Like, why do so many pitch shifters not have an expression pedal input? This one does. It's user interface makes a lot more sense too. Rather than dialing the main knob left or right to shift a certain number of notes, here you simply choose the interval you want to bend to and then use the switch in the middle to choose if that's a bend up or a bend down (or both with the Dual mode). That's far more intuitive than you'll find on nearly any other pedal. You also get 11 full interval options because there's no preset slots eating up space. One of those is 'Detune,' which will pitch shift you by 17 cents and get you that thickening we all like from a chorus but without the modulation. You also can transpose by 1, 2, or 3 octaves in either direction (or both!). After that, you get 7 intervals to choose from covering all of the main ones you'd use, which are a minor and major 2nd, major 3rd, perfect 4th, perfect 5th, major 6th, and minor 7th. And with the expression pedal option you can bend into and out of them. This pedal is also polyphonic, meaning it can handle chords from rhythm guitar as well as melodies from lead guitar or bass. With the polyphonic ability in place, you can even use this to drop tune and use other alternative tunings and then jump right back to your standard tuning when the song is over. That's a huge time and headache saver. You'll notice the Latch / Momentary button as well, which lets you turn the switch into a momentary actuator. In that mode, the switch lets you press and hold it down to turn on the effect and release to turn it off, so you can produce moments of ear candy during solos or choruses, for instance. This is the pedal you want, in my opinion, if you want to stick in the "standard pedal price" range. 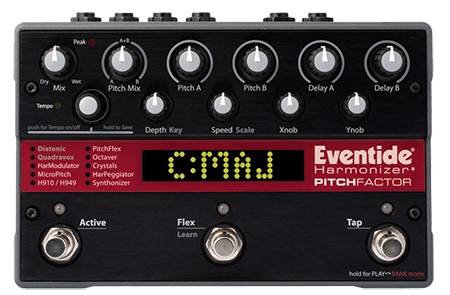 The company themselves describes the Eventide PitchFactor as the "multi-voice intelligent pitch shifter from the company that invented it!" This piece of magic is used by groups and people like Steve Vai, St. Vincent, Deadmau5, and Katy Perry. That's because there's nothing else quite like it in terms of quality and an insane amount of options. The core purpose of the pedal is to be a pitch shifter pedal, but built in are ten algorithms from many of Eventide's other top selling products that give you plenty of ways to mix up a standard pitch shifting. They've brought in all of their most coveted algorithms from the H910, Quadravox, and even the Crystals effect, on to ones like HarPeggiator and HarModulator. Like many others, this one can also be a harmonizer and octave pedal, but this one is also an intelligent pitch shifter, meaning you can tell it which key and scale you're playing in so every shifted note is always in key. It's also polyphonic, meaning it can handle lead melodies or chords. They've gone the extra mile and developed computer, tablet, and smart phone apps to help you control this thing in any way that's convenient. Convenience is a huge aspect to this pedal with its built-in tuner, MIDI controlling and clocking, and expression pedal input. It has true bypass, a rock-solid metal chassis, and sturdy metal footswitches. They covered every base here. It even has tap tempo and auto-detection of which key you're playing in! The pitch shifting is simple. You dial in your key and scale if you want, and then select which interval you want to shift into, whether up or down, or one or two voicings (and even four voices with Quadravox). You can independently control the volume of each pitch, add reverb or delay and control every aspect of that, and bring in your original signal to turn it into a harmonizer. I simply can't even get into all of the 10 other modes offered to further enhance your pitch shifting. The bottom line is that if you're a professional who can't accept any compromises for live performance or studio recording, then this is what you want and need. It is the best pitch shifter pedal. Our "Best Budget Pick" goes to the Mooer Pitch Box, an option which strips out some extra features while leaving other really nice ones in, all in order to provide you with a cheaper and smaller nano pedal. There are two main pieces of the interface you'll deal with, which are the Pitch knob and the Mode switch at the top. The Mode switch gives you the option to make the pedal behave as a harmonizer pedal, a pitch shifter pedal, or a detuner. 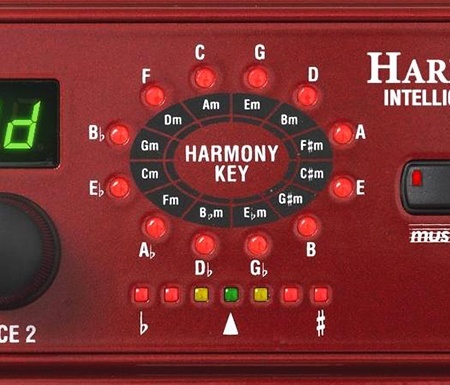 The difference is that a harmonizer will add a harmonic voice to your original signal while the pitch shift will change your original notes by the interval you set. You choose which intervals you want to use using the Pitch knob, which is labeled with plus-or-minus values based on the number of chromatic notes you're transposing through and provides up to 2 full octaves above or below your original pitch. What's nice is that, even on this inexpensive mini pedal, the pitch shifting is still polyphonic, meaning you can send full chords through it with no tracking or accuracy issues. The harmonizer mode is monophonic and not "intelligent," meaning there's no key tracking, but the detune can also handle anything you throw at it. A lot of players like this option to quickly move into alternate tunings and back again, which as you know saves a ton of time and hassle. My one qualm with this is there's no mix control, meaning you can't set the harmony level independently. It is blended at a default unison volume. But none of that matters for the pitch shifting mode, which is why we're here. It also has true bypass! It's a very capable choice and just as powerful for drop tuning. For the player on needing to be conscious of their budget, this is the best option. 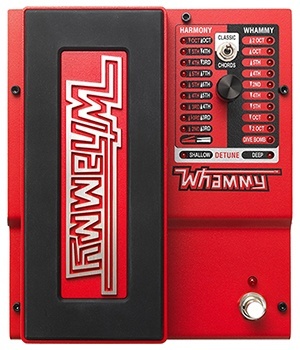 This classic pitch shifter has survived the decades, and now becomes the DigiTech Whammy 5th Generation, adding in even more features without becoming confusing or cluttered. This is why most of the top guitarists alive use it, including Steve Vai, Buckethead, Matt Belamy, The Edge, and countless more. The best part? It has a built in expression pedal. In this 5th generation, it's now true bypass, has a MIDI input, and lets you choose Classic or Chord mode. They've also managed to create an extremely easy to use interface. On the right side you have the Whammy column which gives you a list of intervals to select with the single knob, which goes from +/- 2 octaves, 1 octave, and a 5th, 4th, and 2nd interval. You'll also find, at the bottom, a 3 octave down dive bomb setting which is super fun. You can set the pedal fully forward and leave it there for full-on pitch shifting or rock it back and forth to use it like a whammy bar. The left side contains the Harmony column which provides you with a full on harmonizer pedal, with the added feature of using the expression pedal to rock between the notes in the intervals or blend them together. 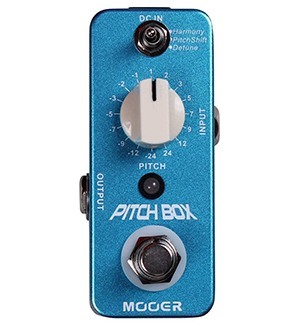 If you want a pure harmonizer then this probably isn't for you, but as a pitch shifter it's pretty awesome if you want the expression pedal option. It also has a shallow or deep Detune options. Deep is a little too much but shallow adds just enough thickness and character, I feel. Get this if you like to bend pitches as much as you like to shift them! 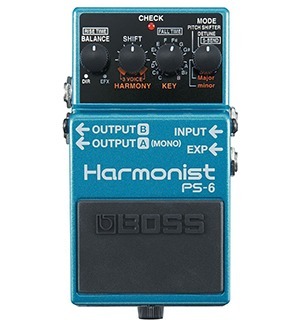 Like the option below, the Boss PS-6 Harmonist focuses on marketing itself as a harmonizer pedal but is a fully capable pitch shifter (they're pretty much the same effect). All you have to do is turn the Balance knob clockwise to drop out the dry signal and only hear the wet effect. What makes this a very powerful pitch shifter is, beyond the fantastic smart harmonization, is that the pitch shifter is polyphonic, meaning it can handle chords too. It tracks fast and accurately, sounding great along the way. That's to be expected for any pedal in this list. But this bad boy can also detune, with up to 3 voices involved, as well as add 2 voices to your pitch shifting if you wish if you turn the Shift knob to the extremes. You'll notice that the Shift knob doesn't have labels on it, but they include all of the classic choices you'd make, like minor and major 2nds, major 3rds, perfect 4ths and 5ths, octaves, etc. It also features an S-Bend mode, meaning 'super bend,' that turns the pedal into a whammy. The Balance and Key knobs became Rise and Fall Time controllers in this mode, letting you set the glissando rate so you're not trying to create a smooth curve with your foot. This mode offers you -3 octaves and up to +4 octaves, letting you create dive bombs and anything else you can come up with. You can also slap an expression pedal in there for more granular control. As always, Boss builds them like tanks, so you know you'll get as much time out of these as you need. 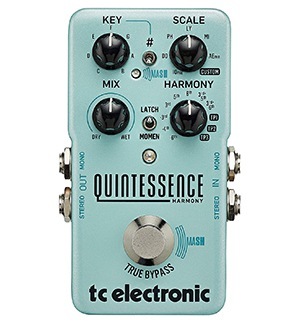 Honestly, the TC Electronic Quintessence could have just as easily been our "Best Bang for the Buck" pick too. I just happen to find its interface a bit confusing and its focus on being a harmony pedal more so than a pitch shifter is what decided it. But this is still a fantastic pedal with very high-quality algorithms guiding it. You'll notice immediately that not only is this a "smart" pedal, meaning you can tell it which key you're playing in so you never get notes out of key, you can even tell it what scale you're playing. That's powerful, especially if you need that. You won't find that on many other reasonably priced pedals. To turn this into a pitch shifter all you have to do is turn the Mix knob all the way clockwise to the 100% wet setting. This way, you only hear the voice being generated and no longer hear your original dry signal. You get 11 harmony / pitch shift settings (3 of which are for TonePrint presets). There's no native octave shifting though, so I recommend using a couple of the presets for that. It also has a Latch / Momentary mode switch to change the footswitch to where you can press and hold it down to turn on the effect and release to go back to true bypass mode. You can even use Mash mode to turn the switch into a pressure sensitive button to act like a whammy. It has stereo outputs if you desire, as well as the amazing TonePrint feature where you can download professionally made presets and even beam them to the pedal from your smart phone's bluetooth through your guitar's pickup. This is a very interesting and powerful choice, especially if you want one pedal to both harmonize and pitch shift. Pitch shifters are becoming an oddity these days. It's nearly impossible to find a pure one since they all now combine octave and harmonizers all in the same chassis. That's really a bonus, on top of them being "intelligent" harmonizers and the pitch shifting being polyphonic. What you're really looking for is the best algorithms that produce the highest quality tone (crappy ones sound like synthesizers) that track fast, accurately, and polyphonically. And that's what you'll find above in our list of best pitch shifter pedals.